With increasingly fierce competition, retailers need to embrace digital transformation to provide an unforgettable experience to gain a competitive advantage and retain loyal customers. Reach out to CDW to learn how retail digital transformation can help grow your business while keeping your customer data secure. At CDW, we get retail IT. Speak with a retail technology expert today. Call to speak with a retail technology expert. Watch as CDW Field Business Architect Aaron Lagowski considers the major aspect of retail technology and how it aligns to your business objectives. Cyberthreats, data breaches and privacy vulnerabilities are not only possible — they are a reality for retailers big and small. 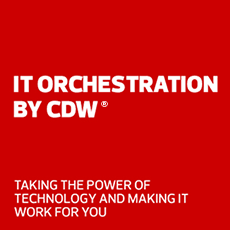 CDW has in-depth knowledge of effective cybersecurity techniques, such as network segmentation, penetration testing, endpoint protection, network patching and malware identification. Whether it’s security software, physical security solutions or meeting new compliance requirements such as GDPR, we get retail security. Designed for retail and hospitality businesses, CDW Threat Check reveals present cyberthreats as well as network vulnerabilities before they become a problem. Mobile devices and mobile point of sale (mPOS) devices allow for increased operational efficiency across the showroom floor and well into the back of house. With mPOS, your staff can view and manage inventory across the supply chain and give customers a smoother checkout process. Digital signage solutions and kiosks are more than attention-grabbing screens — digital signage, self-serve kiosks and visual software solutions allow retailers to connect and engage directly with customers and collect valuable data. Retail organizations can also leverage durable digital signage screens outdoors to keep messaging fresh. Digital transformation doesn't need to be difficult, but it can be challenging on knowing where to start. Greater productivity, increased operational efficiency and cost savings are possible with retail IT solutions from CDW that incorporate wireless and guest Wi-Fi, mPOS, RFID tracking, beacon technologies, security, visual solutions, cloud solutions and more. Collecting customer data is only part of the equation when it comes to retail analytics – next comes the challenge of turning this data into actionable intelligence and a personalized shopping experience. CDW and partners such as IBM and Splunk can help you gain a competitive advantage by taking machine data and transforming it into insight to increase revenue, enhance security and gain multichannel visibility. Collecting customer data is only part of the equation when it comes to retail analytics — next comes the challenge of turning this data into actionable intelligence and a personalized shopping experience. CDW and partners such as IBM and Splunk can help you gain a competitive advantage by taking machine data and transforming it into insight to increase revenue, enhance security and gain multichannel visibility. Is your business ready for a custom retail IT solution?